I fell in love with fabric decoupaged buckets as Easter baskets a couple of years ago. (Three to be exact...where did THAT time go?) 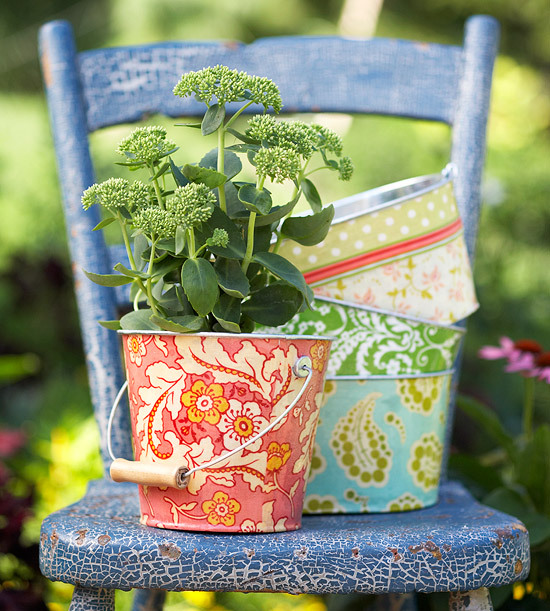 And I was reminded of them when I saw these fabric wrapped pails over at BHG. So in addition to cute Easter buckets, they are a great way to add some Spring color to your garden or front porch. And if you use a big enough bucket, they make a great drink cooler for your Spring picnic. You can check out more info on how to decoupage fabric unto buckets over at Better Homes and Gardens.